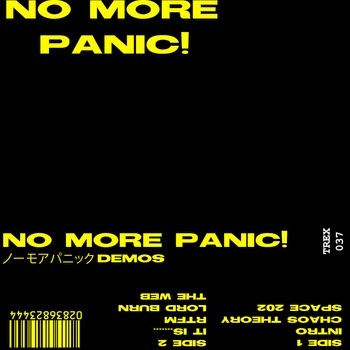 No More Panic! may hail from New York, New York, but the band’s Demo+S tape is decidedly Germanic in the best possible sense. A dry, terse brand of Krautrock reigns here, lightly with samples standing in (nicely) for a definitive figurehead or perspective. Intensities on offer range from sharply Spartan to slightly more exercised rhythms grooving along on a tread of synthesized bleeps, bloops, and beats to busier, loopier excursions. Spanning a half hour in total, all elements hang together nicely in representation a somewhat mysterious unit with an in-gestation aesthetic; I’m not afraid to admit that No More Panic! made for an effective soundtrack for a long walk on a recent, early Spring afternoon. The overall vibe is just a few inches above a sort of horror-flick camp. Looking forward to hearing where the muse leads this group in the future; whatever it is, hopefully it will involve more chopped and screwed Arnold Schwarzenegger one-liners. The album can be heard here.